Our challenge today is to set a checkbox in a group on a Salsa signup page. Doing so will make this the default group to which the new subscriber will be added. The "before" picture shows a list of groups that a supporter can join. 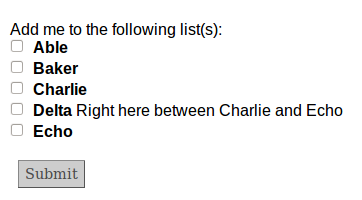 We'd like to help the supporter just a bit by suggesting "Charlie" as a group to join. So let's go ahead and check "Charlie." Edit your signup page, then click on the "View Page" anchor in the publishing box to view it. View the source by choosing "View|Source" from the Firefox menu. Write down the checkbox's name. 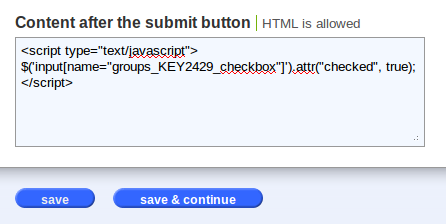 In my case, the checkbox is named "groups_KEY2429_checkbox". Yours will be different! Now for the important part. Change "groups_KEY2429_checkbox" to the name that you found for your checkbox. Just type it in there, leaving the quotation marks intact. Double-check your work, and then click the "save" button. Now for the test. Click on the "View Page" button in the publishing box, and Voila! Your checkbox is checked! Next time, we'll find out how to change an abbreviation in the list of states. Until then, hope y'all have an excellent week!